Are you the funny one in most groups? My characters are pretty farking funny and that always seems to come through in my books, which is a great thing! BF#1 is a cat. She jumps at her own reflection and when the toaster pops up. The most hilarious part of her is her reaction to the things she finds funny. She has an amazing, infectious laugh and that’s what makes everyone else laugh so uncontrollably around her. “I’m freaking hilarious!” is her favorite statement, and in her own way that is so true! BF#2 is the in-your-face, I’ll tell you how it is kind of funny. Think Lisa Kudrow meats Dennis Leary. For the most part, it’s all done in fun, but there have been plenty of times when the person she was talking to was the only one not laughing. It’s wrong to laugh at those times, I know, but damn it’s funny. My sister is possibly the funniest person I have ever met in my life. She has a quick mind that is always stuck in Sarcasticville, Rob Zombieland, and her significant other is just as bad. He just straight breaks out into song at random and there’s no limit to how easily he can take an innocent conversation and spin it into the funniest scenario you’ve ever heard in your life. They’re both just mostly wrong in all of the best ways. What kinds of things do you find funniest? The random outburst. That muttered, under your breath extension of a serious statement. The meme that is all too true. The “HERE’S YOUR SIGN” moments. The inside joke no one else gets. The promises politicians make. Those rare occasions when you see someone struggle with the quip they want to spout off with, but can’t, because they’re at a funeral or something. Both the imagined quip and their suffering is quite entertaining. Mostly, I have a very high appreciation for those books that make me laugh aloud in public, so everyone looks at me like I’m crazy. Good times! 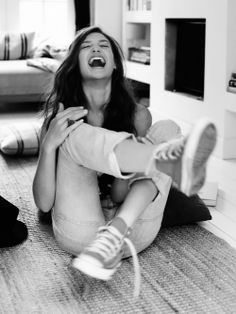 😉 Of course, nothing beats those moments when you laugh so hard every muscle in your stomach feels it for days. No matter what the situation is, I love to laugh and I’m quite blessed being surrounded by so many people that are quite uniquely funny 99% of the time.